Laminate Floors; Are They for You? Laminate floors make a great selection if you have small children and pets. They are stylish and versatile and unlike hardwoods, they are also very scratch and dent resistant. The thicker the core material the more it resembles true hardwood flooring in both feel and sound. Laminate flooring is also not prone to fading like a true hardwood nor do they stain like their more expensive counterpart. One area to be cautious about is the finish. A high quality product requires basically no maintenance once installed. There are a variety of finishes available and the less expensive options to purchase may not be cost effective over the long haul. The finish you should look for is a lacquer with a certification that it is environmentally safe. This will give you the durability you are looking for as well as the safety from toxins for your family. 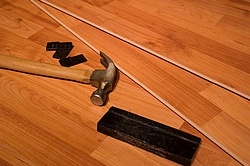 The real disadvantage of laminate flooring is that it is still not real hardwood. That said, it's acceptability in the market has changed due in no small part to green building advocates. It is no longer looked at as a poor mans wood flooring but rather a viable ecological alternative depending upon your families use. Like vinyl, laminate flooring is a good do-it-yourself choice. Manufacturers vying for a share of this market have made installing an easy task. There are a variety of installation systems out there which basically do away with the messy flue down applications. Another upside to laminate flooring is that most quality products come with fantastic manufacturer's warranties. Some even with a lifetime warranty.